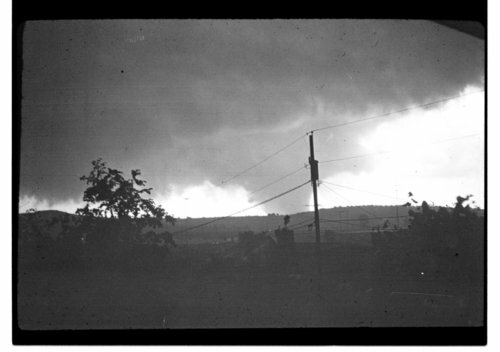 This is a photograph showing a tornado possibly coming over Burnett's Mound in Topeka, Kansas. The magnitude of this storm was unprecedented in Topeka. Registered as an F5, the powerful storm traveled from the southwest of the city to the northeast, causing the deaths of 17 people, and more than $104 million in damage. The tornado was on the ground for 34 minutes, and left a path of destruction 21 miles long and one-half mile wide.